If you encounter random advertisements shoved into your face when you browse popular websites, it is very likely that these websites are signed as Ads By Senseplus. 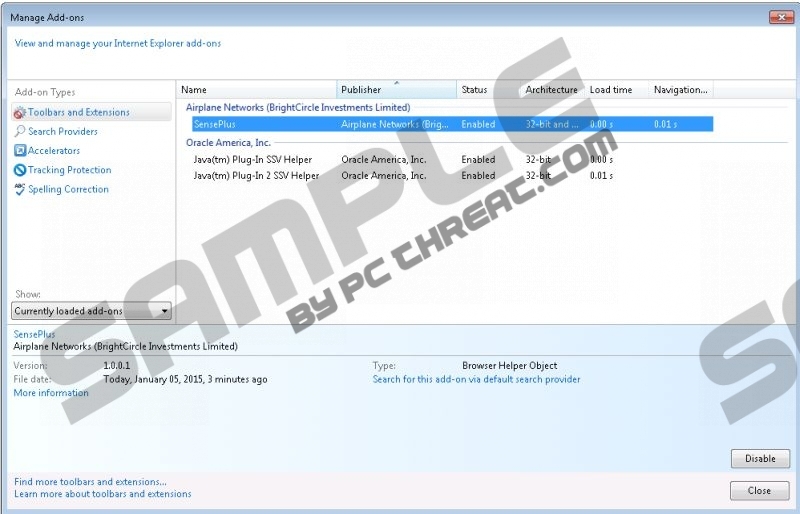 Senseplus is an adware application that is based on the Crossrider engine, and it is practically identical to Object Browser adware. Hence, you can get rid of Ads By Senseplus by removing Senseplus from your computer. For manual removal instructions, please scroll down to the bottom of this article. Don’t forget that you should also scan your PC with a computer security tool of your choice to look for other potential threats. The reason we say that you must look for other potential threats is that Senseplus certainly doesn’t travel alone. There is not direct distribution source that would allow you to install this adware application. Just like Object Browser, Senseplus has arrived bundled with freeware. Therefore, it is very likely that you have multiple unwanted applications on your computer, gathering information on your web browsing habits, trying to convince you that you must click Ads By Senseplus and other commercial pop-ups. Needless to say, you should refrain from clicking anything that is delivered to you by an adware application. Ads By Senseplus will appear in Google Chrome, Mozilla Firefox, and Internet Explorer. Senseplus usually gets installed on your computer silently. This means that although you might initiate the adware installation, you are not informed about Senseplus being installed on your PC. The program’s processor, Object Browser, was known to travel around with Jollywallet, YTdownloader, and other potentially unwanted applications. Thus, there is a good chance that Ads By Senseplus appear on your screen because you installed the adware application responsible for it along with some other program. If you have recently downloaded and installed a freeware application from a third-party file sharing website, that might be your answer as to why you see Ads By Senseplus when you browse the web. Needless to say, Ads By Senseplus will not infect you with malware unless you allow it to. Meaning, you should never click them because there is no guarantee that you will be redirected to a reliable website. For all its worth, Ads By Senseplus are not there to distribute malware, but these adware applications are highly vulnerable to third-party exploitations. Consequently, Ads By Senseplus might contain links to corrupted website if the program gets exploited by cyber criminals. You have to protect yourself from exposure to dangerous websites by removing all unwanted programs from your PC. If you remove Senseplus, Ads By Senseplus will disappear as well. After manual removal, do not hesitate to scan your PC with the SpyHunter free scanner. Click Uninstall a program and remove Senseplus. Open Uninstall a program and remove Senseplus. Select Add or remove programs and uninstall Senseplus. Quick & tested solution for Ads By Senseplus removal.